Has it ever seemed like you were seeing the same ad over and over again while you were surfing online, almost as if you were being followed? Well if this sounds familiar, chances are you were being served retargeting ads, which can follow you from site to site as you browse. While not necessarily a new form of internet marketing, retargeting ads are becoming increasingly common as companies such as Google and Microsoft get involved. 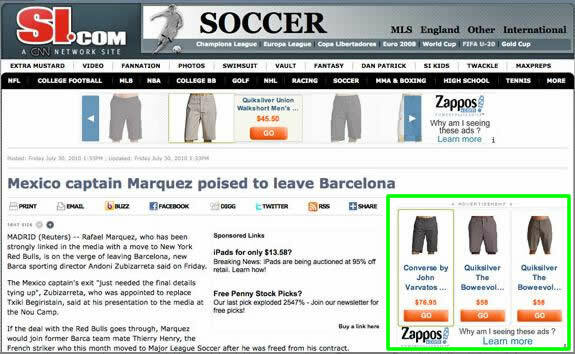 Coupled with the precision of current targeting technology, these types of ads can often seem invasive, which is exactly what happened in the case of Zappos.com, where a woman was seemingly ‘followed’ around the internet by an advertisement for a pair of shoes she had shown interest in. Retargeting ads focus on consumers who have actually been to a particular site, and your opinion of these types of ads would probably depend on which side of the process you are on. At Fannit: Inbound Marketing Agency in Seattle, they all agree that retargeting ads are a great tool to use across an ad network, since you have the ability to retarget your site visitors as they visit hundreds of sites, whether they are browsing or actively searching before making a buying decision. By reaching them with a tailored message based on a specific site interaction (such as looking at a particular pair of shoes), they can convince that consumer to return to their site and complete the desired transaction. This highlights one of the biggest benefits of retargeting, which is the ability to build and retain customer interest/awareness throughout the consideration phase. Consumers on the other hand may feel kinda weird about the idea of being ‘followed’ online, or that they are somehow being ‘watched’ while they browse the web. These uneasy feelings have lead to some discussions about federal regulation in the realm of digital advertising, in the form of a ‘do not track’ list, similar to ‘do not call’ for the Internet. With the success this form of advertising has created, unless there is major regulation, it’s fair to assume this trend of retargeting messages will continue to grow. However, it is important for businesses to realize that while they may be reaching consumers when they are in the mood to buy, they may also be alienating them at the same time. Please share your thoughts on how you feel about this type of digital marketing, or what you are doing instead to promote and grow your business online.